Consciousness in Death; Truth or Fiction? Author: Tamel, Frank J (1923 – 2014) served as founder, Pastor and Pastor Emeritus of Parkway Apostolic Church in Oak Creek, Wisconsin. Type of book: Non-fiction, Religious. Purpose: To advance the biblical teaching that the dead are dead, not to be conscious again until the resurrection – to offer an alternative view of the state of the dead. This book represents a collection of notes prepared over the years for sermons on different parts of the subject given over the years. The pastor’s family encouraged him to gather the notes, to write and publish the book because if he didn’t, they contended, when he was gone, the study would be gone as well. 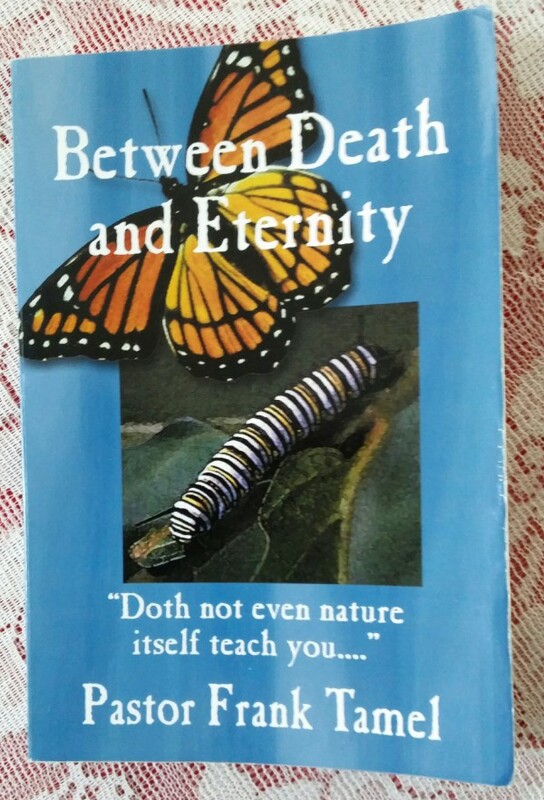 Pastor Frank Tamel is gone now, but this study lives on in a book that should challenge the beliefs about the intermediate state of the dead of any critically thinking student of the Word.  There can be no punishment or reward until after judgment.  There are passages in the Bible that do not seem to reconcile with the idea that we are conscious in death.  Greek thought has had an influence on Christian doctrine – beginning with our concept of the soul.  The idea of souls in heaven before the resurrection of the dead was considered heresy in the 2nd century of the church age. It wasn’t until 300 – 400AD that the church began teaching consciousness in death.  While there are passages in the Bible that seem conflict with Pastor Tamel’s premise, a closer examination of those scriptures reveals a plausible explanation for each. Lazarus and the rich man (Luke 16:19-31) – To paraphrase, a rich man dies and is buried in the usual way, but a poor man named Lazarus, who in life was set up as a beggar at the gate of the rich man, dies as well, but an extraordinary thing happens. Angels come and carry the body of Lazarus away. The two find themselves in very different places: the rich man lifts his eyes in hell to see that Lazarus is in the bosom of Abraham and calls out to get their attention. As you can see, this biblical narrative seems to paint a picture of consciousness, awareness and even discourse after the death of our two characters. The author does a masterful job of explaining this passage as a parable. He points out the impossibility of the rich man being in Hell before his judgment, that there is no where else in scripture that mentions Abraham’s bosom and explains all the symbolism. The penitent thief on the cross (Luke 23:39-43) – Because of what Jesus said to the thief on the cross next to Him, some have attempted to make a case for that thief entering heaven by the end of the day. Nothing could be farther from the truth and the author adeptly explains the passage and puts this challenge to rest. King Saul and the witch of Endor (1 Samuel 28:1-20) – This is a very controversial passage of scripture because there is some confusion about what actually took place. Because Saul, the king of Israel, could not get counsel from God anymore, he turned to a witch to get direction with regard to his impending battle with Achish, Captain of the Philistines. Two things are for sure: 1-Samuel is dead (verse 3). 2-Samuel was summoned back from the dead (verses 12-14). Yes, Samuel was called back! Samuel asked why Saul woke him up – why he was brought up [out of the grave]! In your reading of this section of the book, you’ll see that the author dedicates some time and effort to this passage and does a good job addressing the challenge of Samuel and the witch of Endor. On page 74 the pastor references George W. Osmun, The Undiscovered Country, Abingdon Press, New York, c. 1916 in which the author lists 11 passages of scripture that, in his opinion, indicate decidedly the continued consciousness of the dead. The pastor addresses each in his book – as referenced here. 1. God is the God of the living and not of the dead (Matthew 22:31-32). 2. Christ met with Moses and Elijah at the Mount of Transfiguration (Luke 9:28-36). 3. Paul seems to say that to be absent from the body, present with the Lord (2 Corinthians 5:6-8). 4. It appears that Paul says he wants to depart to be with the Lord (Philippians 1:21-24). 5. Stephen, being stoned, calls out to God saying, “”Lord Jesus, receive my spirit (Acts 7:59-60). 6. A passage says that whether we’re awake or asleep, we should live together with hi (1 Thessalonians 5:9-10).